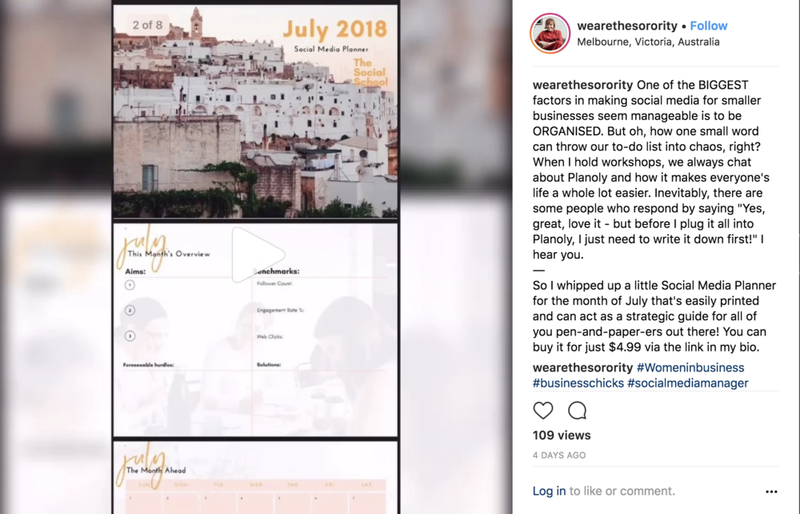 The way the Instagram algorithm is working at the moment means that you’ve only got a limited amount of time to capture the attention of your audience, before they’re prompted to move on and engage with other content. However, if you’re putting time and effort into creating each post you want that engagement, right? So what’s the solution? A CTA (a call to action). To make the most of each post, you need to include a sentence or a phrase during the caption that tells the reader what they can do next for more information, further reading, products or services and so on. CTA is an abbreviated term in advertising land for ‘Call to Action’. Often when a copywriter is briefed, they’ll have to come up with several CTA’s at the end of the copy to inspire the person reading to take an immediate action. The same goes when you’re writing your own Instagram captions - you need to encourage the person reading to take an affirmative action, one that benefits both parties. Them, because they’ll get value from whatever you’re offering, and you, because you’re increasing your engagement or website traffic. Unless you’re a trained writer, it might not feel natural to include this type of language at the beginning, but it’s important you start somewhere - and when you see the engagement on your posts lifting, and your web clicks increasing you’ll know you’re on the right track. Follower > sees post > reads post > does nothing. Follower > sees post > reads post > takes action (as specified by you) > engages further > purchases/signs up/enquires. So what are some examples you can use in your captions? They fall into two different categories; engagement CTA’s or link CTA’s. Engagement CTA’s are designed to increase comments and conversation on your individual post. Ask a for a personalised response; ask what your follower’s experiences are on the topic, what their opinion is, what advice they’d give, what advice they’ve been given, what they think the best option is, what they’d do etc. Ask for a fun reply; ask what their favourite of the two options are, ask what their favourite book/movie/song is, ask them to tell a story in response, or just simply ask for them to comment their emoji reaction to the post. Ask them to tag someone; this is a really great way to boost engagement, as you’re doubling the amount of people who will see the post. Simply say; ‘tag a friend who…’ or ‘tag the friend that…’ etc. Make sure you’re using active words, like share, comment, tell me, etc. to make the action as clear as possible. This one’s pretty simple; count the number of times people are commenting or tagging their friends. Have a look at the average amount of comments you get now, and use that as a benchmark. Aim for two additional comments per post that has a clear CTA from now on, and as your followers grow naturally, so should this number. Also, test different CTA’s. See which ones work best and make a note for future posts. Link CTA’s are for the times when you need someone to click the link in your profile to get more information, sign up to an email list or purchase a product or service. These are more straightforward, as they simply involve encouraging people to ‘click the link in bio/profile’ to take action on that post. It could be pointing people to a blog post, or a new product - either way, they need to simply click on the link and that’s the action taken. From there, it’s your website’s job to keep them engaged and purchasing or signing up for a service or email newsletter. 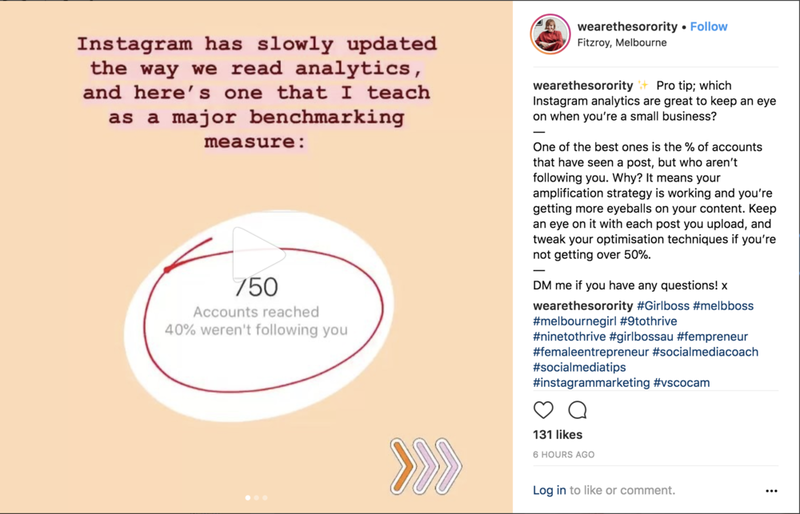 There’s a handy new section in the Instagram analytics section; on the front page, that shows you how many people clicked on each different button in your profile (only available with Instagram Business profiles) so you can keep track of your progress. Just like the engagement CTA’s, benchmark where you’re at now and aim at consistently increasing that number. *Tip with link in bio; if you have access to your website, create a new page and call it www.xxxxxxx.com.au/instagram. Create buttons on your page that are easily updated, and link to 5-7 different places on your website that you want people to go to from your social media channels. This way, your audience gets what they want straight away, and aren’t left navigating around your website to find your products, blogs or services. 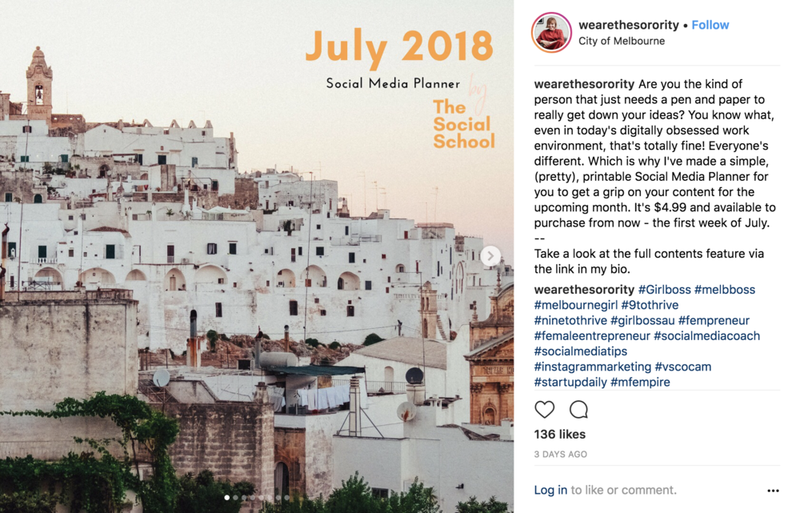 If you need an example, go to www.thesocialschool.com.au/instagram on your mobile. This is really easily done for those of you with Squarespace websites, and for those of you without, have a chat to your web developers - or, there’s a company called linktr.ee that provide this service for $6/month.